The park is open daily from 9 a.m. to 5 p.m. with the last shuttle bus departing Lower Town at 5:45 p.m. and closed Thanksgiving Day, Christmas Day, and New Year's Day. There are some fee-free days as well as participating discount programs. Please see the website for more details. Visit our many museums and exhibits, hike our trails, join a ranger-guided tour or just tour on your own. The Harpers Ferry Historical Association's Bookshop has a great supply of books, artwork, postcards and items for kids of all ages. Picnicking is allowed in the designated picnicking area adjacent to the Cavalier Heights Visitor Center parking facility. This area is open on a first-come, first serve basis. Please note open fires, grills and alcohol are not permitted anywhere in the park. Visitor center, exhibits, Lower Town is the most visited area of the park. Historic buildings along Shenandoah, High, and Potomac streets house park museums, exhibits, the park information center, and bookshop. Some of the popular places to visit in Lower Town are John Brown's Fort and The Point. Most exhibits are fully accessible. Wheelchair accessible shuttle bus available on request. Pets must be kept on a six-foot leash at all times while visiting any area of the park. Pets are not permitted on the park shuttle buses or in park buildings. Pets also may not be left unattended while their owners explore the park. All pet waste must be removed from the park. Visiting pets should be accustomed to crowds and capable of good behavior in the presence of other pets and wildlife. If your pet escapes its leash and becomes lost in the park, please notify park staff immediately. Never abandon a pet, wanted or unwanted, in the park. 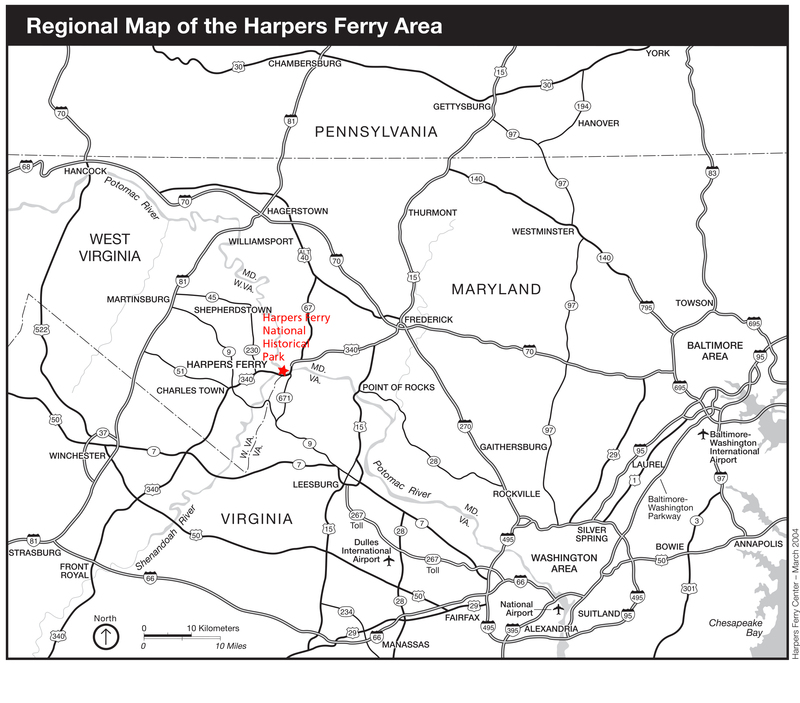 Thye history of Harper's Ferry has few parallels in the American drama. It is more than one event, one date, or one individual. It is multi-layered - involving a diverse number of people and events that influenced the course of our nation's history. Harpers Ferry witnessed the first successful application of interchangeable manufacture, the arrival of the first successful American railroad, John Brown's attack on slavery, the largest surrender of Federal troops during the Civil War, and the education of former slaves in one of the earliest integrated schools in the United States.